"If I have seen farther [than others], it is by standing upon the shoulders of Giants." Issac Newton, in a letter to Robert Hooke, 1675. Almost seventy years after his death, Thomas Edison remains an icon of invention. His record of 1,093 patents is still the most issued to any individual. Three major books, a television movie, and 4 volumes of his papers were published in the 1990s alone. A 1999 Time-Life publication even named Edison the most important person of the past 1000 years. Yet, for all of his accomplishments, Edison did not start from scratch. By 1869, when Edison declared his intention to become a professional inventor, an electrical industry was already established. Telegraphy had provided employment for Edison and the opportunity to learn about electrical technology. Pioneering work by Franklin, Faraday, Volta, Morse and many others laid a foundation upon which Edison built. Some of the more important prior developments are shown below. The most exciting electrical invention at the beginning of the 19th century was the battery. It produced a constant electric current, opening the way for many other discoveries and inventions; it also provided power for the telegraph and telephone industries. In 1800, Alessandro Volta announced his invention of a battery similar to the one shown at right. The "voltaic pile" operated by placing pieces of cloth soaked in salt water between alternating zinc and copper discs. Contact between the two metals produced an electric current. Many refinements were introduced by the 1870s that lengthened battery life and addressed problems like "polarization." Within a year after Hans C. Oersted found a relationship between electricity and magnetism, Michael Faraday used this knowledge to build a simple motor. More than 50 years would pass, however, before motors became useful -- mainly due to the need for a strong source of current. 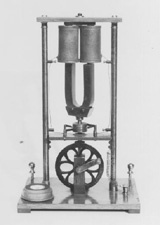 In 1847 Gardiner Colton, a New York doctor, built this motor to illustrate his scientific lectures. It moved around a small circular track. In 1831 Michael Faraday discovered that moving a magnet near a loop of wire produced an electric current in the wire. This is the basic operating principle of a generator. Hippolyte Pixii built this "magneto generator" soon after Faraday's announcement. The term "magneto" means that the magnetic force is supplied by a permanent magnet. In Pixii's machine the magnet rotates under the coils of wire. A critical breakthrough, the "self-excited dynamo," emerged from the work of Charles Wheatstone and Werner Siemens in 1867. Working independently, both inventors developed generators in which a wire coil rotates between the poles of an electromagnet which gets its electricity from the machine itself. The dynamo could produce much more electrical energy than the magneto and thus made possible efficient use of motors and lighting systems. Scientists studying electricity quickly saw the need for accurate and reliable meters. Later, telegraphers and other users of electricity found it necessary to devise meters for their special needs. In 1825 Leopoldo Nobili designed the first precision instrument for measuring electric current. Current in a coil produces a magnetic field which causes a needle inside the coil to twist. The amount of twist is the measure of the current. A second needle placed outside the coil allows the device to account for earth's magnetic field. The electromagnet proved a critical element in most major electrical inventions of the 19th century. Motors, generators, telegraphs and telephones were the major examples. Any electric current produces a magnetic effect. William Sturgeon made an electromagnet in 1825 by passing a current through a bare wire wrapped around an iron rod. Joseph Henry constructed powerful electromagnets by using many windings of insulated wires. The iron core shown here is from Henry's experiments of 1827. Henry later became the Smithsonian's first secretary, due mainly to his international scientific reputation. Humphry Davy demonstrated to the Royal Society in 1806 that a powerful light could be produced by establishing an electric arc between two charcoal rods. His experiments, powered by banks of batteries, did not result in practical lighting devices. But, the appearance of good generators in the 1860s and 1870s encouraged the invention and application of a wide variety of arc lamps. Arc lamps like this Brush patent model from the 1870s provided many cities with their first electric streetlights. Operating an arc lamp was labor intensive since the carbon rods were consumed as the lamp burned and had to be replaced often. The light was so bright and powerful, however, that arc lamps continued in use well into the 20th century. Edison's goal lay in "subdividing the light" of an arc lamp, meaning to develop a lamp that produced a small amount of light suitable for use indoors. Ideally, many small lights would operate for the same current as one arc lamp and could be turned on and off at will.